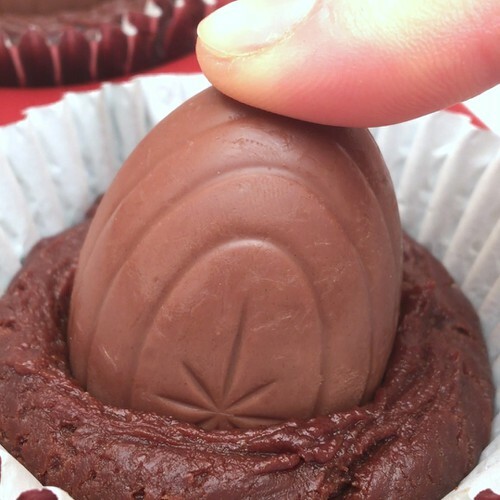 Creme Egg cupcakes! How do you eat yours?!? Place into a microwaveable bowl the butter, sugar, dark chocolate, coffee and water. Heat in the microwave, stirring often until all ingredients are melted together and mixed. Add the eggs, self-raising flour and vanilla extract and mix well until you have a smooth paste. Line a muffin tin with cupcake cases, and fill the cases half way with the cake mix. Add a Creme Egg to each case and push the Creme Egg down into the mix. Add more cake batter on top so the eggs are just covered. Bake the cupcakes in the oven for 20 minutes at 160°C, then take them out and let them cool. Decorate the cupcakes with whipped cream, caramel sauce, mixed sprinkles and Mini Eggs.